For his principled resistance to the removal of his people to reservations, Chief Joseph became legendary as a humanitarian and peacemaker. Chief Joseph of the Nez Perce tribe was born in the Wallowa Valley in what is now northeastern Oregon in 1840. He was given the name Hin-mah-too-yah-lat-kekt, or Thunder Rolling Down the Mountain, but was widely known in his youth as Joseph, the Younger, because his father had taken the Christian name Joseph after being baptized at a Christian mission in 1838. Joseph, the Elder, was one of the first Nez Percé converts to Christianity and an active supporter of the tribe’s longstanding peace with whites. The Nez Perce had been a peaceful nation spread from Idaho to Northern Washington. They had maintained good relations with the whites from the time of Lewis and Clark, who had befriended the Indians years earlier when they traversed the Nez Perce homelands. After a time though, the hospitable stance toward the newcomers wore thin as Joseph, the Elder, became increasingly wary of many settlers’ outward desire to obtain more Indian lands. Nevertheless, in 1855, he reluctantly worked with Washington’s territorial governor to set up a Nez Percé reservation that stretched from Oregon into Idaho. Though a step backward for their freedom, the treaty with the US allowed his people to retain much of their traditional lands. Unfortunately for the Nez Perce, the US government ultimately broke the treaty unilaterally several years later. In 1863, following a gold rush in Nez Percé territory, the federal government seized back almost six million acres of the land ceded to Joseph’s tribe under the treaty, restricting the Nez Percé to a reservation in Idaho that was only one tenth its prior size. Obviously betrayed, Joseph, the Elder, denounced the United states, and his Bible, and refused to move his people out of Oregon. He scoffed at the new treaty designed to enforce the new reservation boundaries. The next fifteen years, ending in final surrender, were characterized by steady confrontation and suffering punctuated by brief periods of triumph for Joseph, the Younger. He inherited not only a name but a situation made increasingly volatile as white settlers continued to arrive in the Wallowa Valley. The non-treaty defending Nez Perce suffered many injustices at the hands of settlers and prospectors. Out of fear of reprisal from the militarily stronger Americans, Joseph never fomented violence against them. But the young chief did staunchly resist all efforts to force his band onto the small Idaho reservation. In 1873 a brief glimpse of hope was seen when a federal order was given to remove white settlers in favor of allowing Joseph’s people to remain in the Wallowa Valley. For a short time it appeared that Chief Joseph’s dream of tribal autonomy on traditional lands might actually come true. It was not to be. As was frequently the case back then, the federal government soon reversed itself, and in 1877 General Oliver Otis Howard threatened a cavalry attack to force Joseph’s band and other hold-outs onto the Idaho reservation. Howard informed Joseph that his people had thirty days to collect their livestock and move to the reservation. The Nez Perce Chief pleaded for more time, but Howard told him that he would consider their presence in the Wallowa Valley beyond the thirty-day mark an act of war. Returning home, Joseph called a council among his people. At the council, he sadly chose to acquiesce to the might of the force arrayed against him. In what must have been a gut-wrenching decision he had to choose to abandon his father’s grave to avoid war and the annihilation of his people. Believing military resistance futile, Joseph’s clan reluctantly packed their gear and began making their way toward Idaho. Unfortunately, they never got there. About twenty young Nez Percé warriors, enraged at the loss of their homeland, staged a raid on nearby settlements and killed several whites. 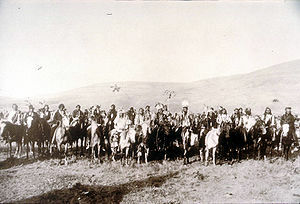 Immediately, the army began to pursue Joseph’s band and the others who had not yet made it onto the reservation. Still hoping to avoid further bloodshed, Joseph continued to lead his people north toward the reservation. For over three months, the band of about 700, fewer than 200 of whom were warriors, fought 2,000 soldiers and Indian auxiliaries in four major battles and numerous skirmishes. The Nez Perce outmaneuvered and battled their pursuers traveling 1,700 miles across Oregon, Washington, Idaho, and Montana. I am tired of fighting. Our chiefs are killed. Looking Glass is dead. Toohoolhoolzote is dead. The old men are all dead. It is the young men who say, “Yes” or “No.” He who led the young men [Olikut] is dead. It is cold, and we have no blankets. The little children are freezing to death. My people, some of them, have run away to the hills, and have no blankets, no food. No one knows where they are — perhaps freezing to death. I want to have time to look for my children, and see how many of them I can find. Maybe I shall find them among the dead. Hear me, my chiefs! I am tired. My heart is sick and sad. From where the sun now stands I will fight no more forever. Joseph’s fame did him little good. Although he had surrendered with the understanding that he would be allowed to return home, Joseph and his people were instead taken first to eastern Kansas and then to a reservation in present-day Oklahoma where many of them died of epidemic diseases. Although he was allowed to visit Washington, D.C., in 1879 to plead his case to U.S. President Rutherford B. Hayes, it was not until 1885 that Joseph and the other refugees were returned to the Pacific Northwest. Even then, half, including Joseph, were taken to a non-Nez Percé reservation in northern Washington, separated from the rest of their people in Idaho and their homeland in the Wallowa Valley. Chief Joseph. Chief Joseph’s Own Story. Originally published in the North American Review, April 1879.